If you need to change the time or date of a booked ticket please use the Manage my Booking section on our websites. If you book a seat for a particular time and your flight is delayed we will honor your ticket and put you on the next available service. You can bring two medium sized suitcases or rucksacks (no more than 20kg each) and one small piece of carry-on luggage free of charge. Please note carry-on luggage must be capable of being placed in the overhead luggage rack or under the seat in front of you. Additional luggage may be subject to a charge of €5 per item. We advise all passengers to keep valuable items such as electronic items, passports, medication etc. on their person. All of our luxury coaches feature on-board toilets. Q: Can I smoke on-board the coach? A: Smoking, including the use of substitute materials such as electronic cigarettes, on-board any Eireagle or Citylink vehicle or within any coach or bus station is not permitted. 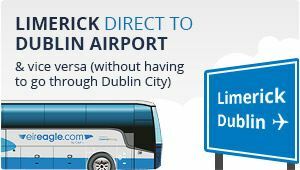 A: Eireagle.com is an express non-stop coach service, taking you direct from either Limerick or Galway to Dublin Airport. Our luxury coaches offer generous legroom, free wifi, and on-board toilets. 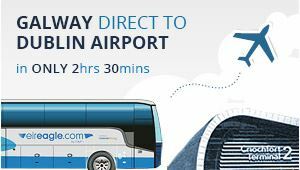 With a range of departure times operating day and night eireagle.com is the perfect way to start or finish your travel in comfort. Q: My flight is delayed I have a booked ticket what do I do? A: If you book a seat for a particular time and your flight is delayed we will honor your ticket and put you on the next available service. Q: Can I amend the time/date on my booked ticket? Q: How much luggage can I bring on the coach with me? A: You can bring two medium sized suitcases or rucksacks (no more than 20kg each) and one small piece of carry-on luggage free of charge. Please note carry-on luggage must be capable of being placed in the overhead luggage rack or under the seat in front of you. Additional luggage may be subject to a charge of €5 per item. We advise all passengers to keep valuable items such as electronic items, passports, medication etc. on their person. Q: Is there a toilet on board the coach? A: Yes - all of our luxury coaches feature on-board toilets. Q: Can I carry a bike on board the coach? A: Bicycles can be carried in the luggage hold of the coach if there is space available. A €5 charge is payable to the driver. Q: I can’t print my booked ticket can I board the coach with just the booking reference? A: You can also show your ticket on the screen of your smart phone or tablet. Q: My ticket is booked under the wrong name do I need to change it? A: Once you have a visible ticket for the driver you do not need to change the name on the ticket. Q: Can I send a package on the coach? A: No, if you are not traveling on the coach we cannot take a package. Q: Can I bring my pet on the coach or in the undercarriage? A: No animals other than a guide dog accompanying a registered handler are allowed on the coach. Q: What age is a child ticket? A: All Children aged 4 to 14 years inclusive can benefit from our great value Child fares. Q: Can my infant travel for free? A: One infant aged 0-3 years inclusive and accompanied by an adult fare-paying passenger, will be carried free of charge. Any additional infants, accompanied by the same adult will be charged at child fares. 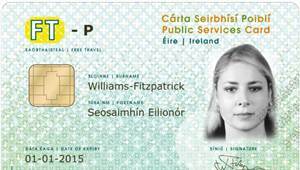 Q: Can I use my Free Travel Pass on your services? A: We accept Free Travel Passes on all our routes. We advise passengers to reserve their seat using our online booking facility. Please note a seat reservation fee applies. Q: I have lost property on the coach what do I do? A: If you have lost property on one of our coaches please fill in out lost property form. We will contact you as soon as possible only if your item has been found. Q: Do Citylink offer refunds? A: Citylink do not offer refunds, please refer to our terms and conditions.